Bad credit hard money loans provide individuals with an asset base as collateral to achieve financing. Lenders providing these options will forgive a low credit score if the borrower has an income and sufficient assets to place in order to fund the loan. This loan is highly risky and expensive for the borrower, and should only be pursued as a last resort option. Securing a loan simply means placing collateral down in order to provide the lender assurance against default. 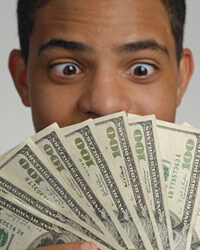 In most cases, securing a loan will make the loan far less expensive. Even low credit borrowers will find reduced expense on most secured loans over unsecured loans. Unfortunately, with a hard money loan, a borrower will lose this key advantage. These loans are being extended to borrowers who do not truly qualify for financing. The lender is simply offering to provide cash in a sum lower than the total value of a given asset against a better judgement that may tell them the borrower has a high chance of default. Because these lenders know the borrowers have no other options and could likely default, they will charge a high interest rate despite the use of collateral. A borrower will have to make high monthly payments on most hard money loans. The loans mature very quickly because of their high risk nature. A borrower is given very little leeway with the payments, and even one delinquent payment could result in very high fees. The fact these loans have very rigid demands makes them extremely risky for the borrower. Again, the lender applies these constraints because they are aware the borrower has few other options. When a borrower defaults on a hard money loan from a high risk lender, the asset that was originally placed as collateral will be almost immediately seized and liquidated. The most typical asset used is a parcel of real estate. This means the borrower's home will be foreclosed on. Most traditional loans include protections for the borrower against a fast foreclosure or the seizure of an asset without notice. However, these high risk loans often have terms that are highly favorable to the lender in the case of a default. The lender can act swiftly to take over an asset and leave the borrower with few options. If there is any way a borrower can take a high risk loan without supplying valuable collateral, the option may be preferable. An unsecured personal loan will have a high interest rate, but very little risk to the borrower. It will also benefit the borrower more in the future because of a faster increase in credit score when the loan is paid off. If a borrower has no other option than a hard money loan, the borrower needs to understand the risk he or she is assuming. As such, having an emergency fund to assist in loan payments is essential. Budgeting and assuring all loan payments are made on time is also critical. Credit Cards For People with Moderately Bad Credit?Tips - Applying For Credit Cards Despite Bad CreditCommercial Hard Money Loans - 3 Business ScenariosShould The Government Guarantee Bad Credit Credit Cards?